Funny Avengers Pic!. 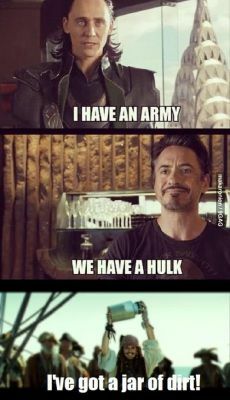 Loki, Tony Stark, and...Captain Jack Sparrow. lol! so funny!. Wallpaper and background images in the The Heroes of Olympus club tagged: photo avengers pirates of the caribbean loki tony stark captain jack sparrow funny dirt hulk army. This The Heroes of Olympus photo might contain multiplex, anime, grappig boek, manga, cartoon, and stripboek. Percy: I have a pen! VS! ARMY AGAINST HULK AGAINST A JAR OF DIRT AGAINST A PEN. WHO WILL WIN!!?!?!?!!?!?!! I bet it will be the dirt! Harry: I have a stick. Clary: I have a stone. Me: GREAT!!! Now we can all play TIC TAC TOE on the DIRT!!! Jack Sparrow: NO ONE TOUCHES MY DIRT!!!!! Leo: I have a fangirl army. What is a fangirl, you ask? They have a Batlike screech that can be heard from blocks away. Jack Sparrow: I have dirt! Avengers: We have a hulk! Leo: Ahem! I have a fangirl army! And a fangirl is a female in between the ages of 11-19 that argue over fictional characters! They also can cause riots to defend against their OTP or favorite fictional character(mostly me).